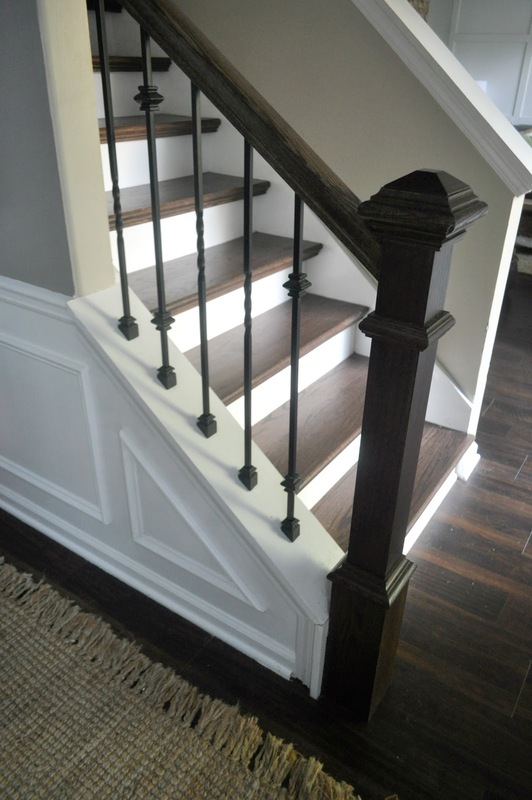 Yall, my stairs have come a long way. I mean seriously. 20 year old carpet and attempting to update décor around it definitely don’t mix, especially in my case, with two dogs on top of it. But gone are the days of the ugly carpet and I can finally love on my stained treads that I longed for since I pretty much moved in! So last year, I posted a 6-month wish list on the blog. You gotta be careful of making wishes because you never know HOW they will come true. Basically from a broken supply line in the master, the old dirty carpet got damaged and had to be replaced. So sad:( Instead of replacing with carpet, we went ahead and got our stained treads done. Yall, the padding was so thin because they were so old! Well, my husband and I had prepared to replace them ourselves through an o so fun DIY project this past Spring. But when the opportunity came from the broken supply line, we high fived because Lord knows this would have been a task to complete! 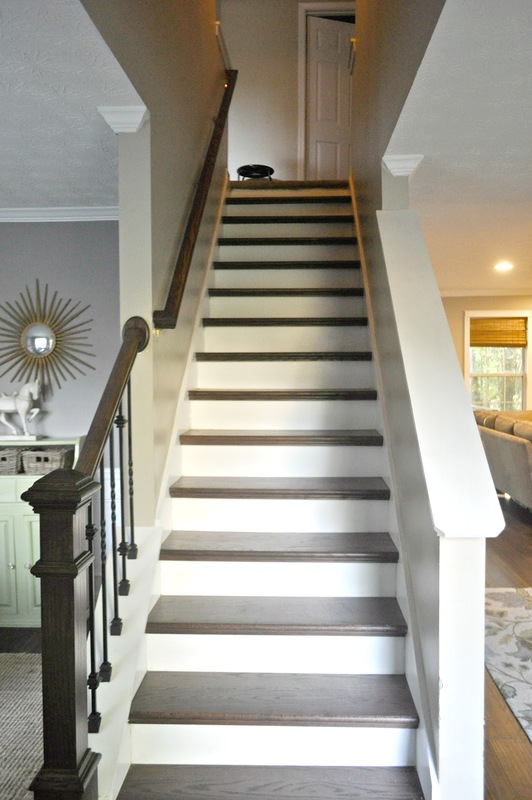 So fast forward to now, through the wonderful work of our contractor, we not have beautifully, stained, chocolate stair treads (insert all the heart eye emojis). And instead of the standard newell, I wanted something more chunky and rich looking. I love it! Surprisingly, they are a lot easier to keep clean than the old carpet. A quick Swiffer, and I am done! So what do you think? Do you love them as much as I do? Next Post DIY Subway Tile Backsplash Reveal!!! Stained is the way to go, I am about 40% done with ours, what a task, ugh. Oh cool. Hope to see yours on your blog! Hello Erin,This is just unbelievable. 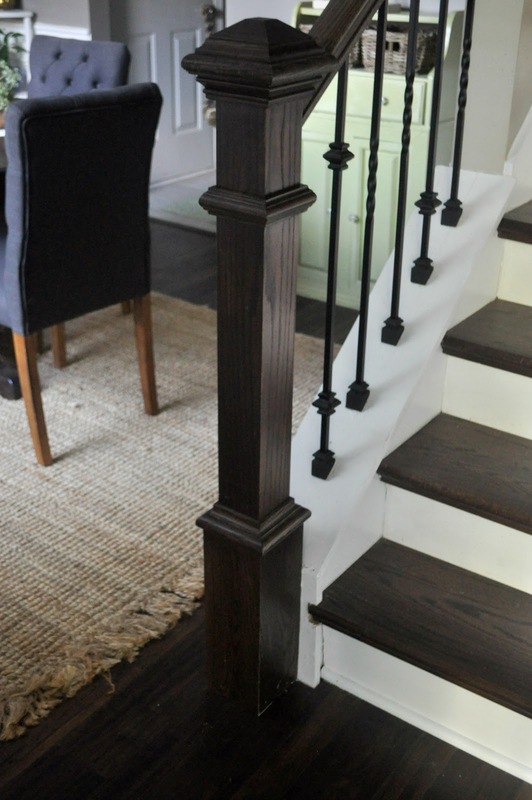 The redo of the stairs is gorgeous. It is a very professional job. Alas, I don't feel I can undertake this one. I have some info for you. Annie Sloan chalk paint. 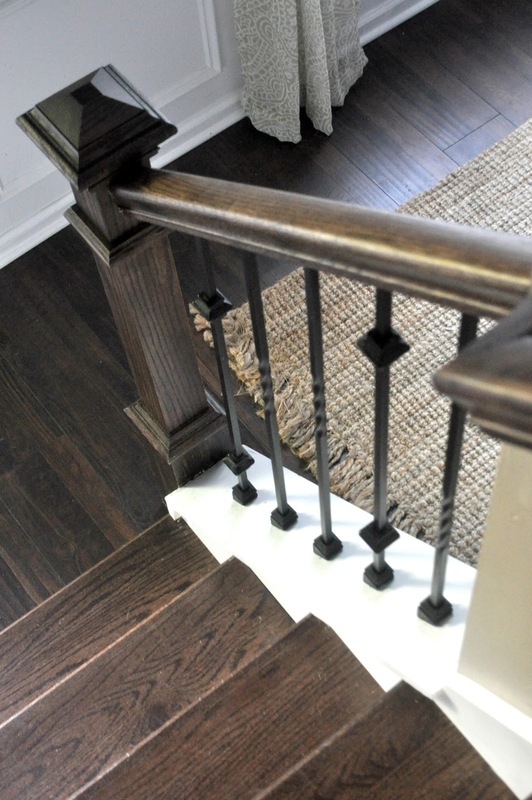 I had an oak table and chair set – lots of spindles on the chairs. 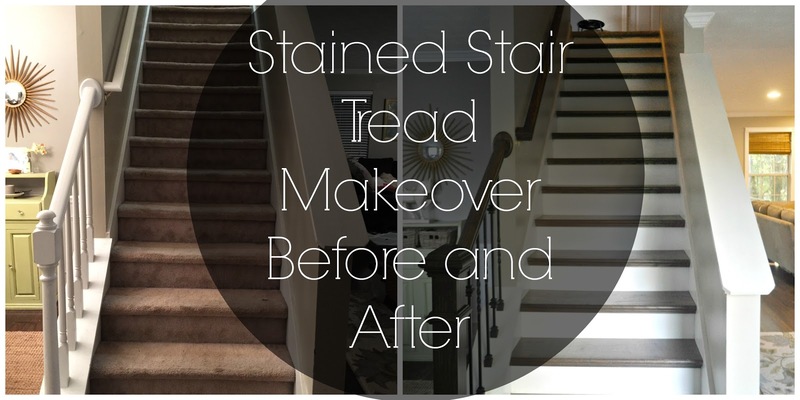 We re-stained the top in a dark stain, similar to your stair stain. The chairs would have been quite impossible to do. We found the chalk paint idea – you spray water on the piece, and dip the brush in the chalk paint – very thin, don't worry about brush strokes – 2 or 3 coats. After drying for 24 hours, we used soft wax to finish it. Buff after 24 hours – really is holding up well in our very busy kitchen. I can send before and after pictures to you. We also transformed our bathroom vanity – it was our old bedroom furniture that we had stained and shellacked. You can paint over pretty much anything with the chalk paint – just clean it with a cleaner they sell along with the chalk paint. The bathroom piece we finished with shellac because of the moisture in the room. I'm sure you can find a number of projects to take on once you discover this paint. Yes I am aware of the chalk paint. Thanks for stopping by! They look fantastic. We painted our back stairs for now. Both sets are on my wish list when we redo the floors. Thanks Lauren. Its definitely an upgrade that i am thankful for! Looks great Erim! It's adds a totally new look to your house! Now I want some!! 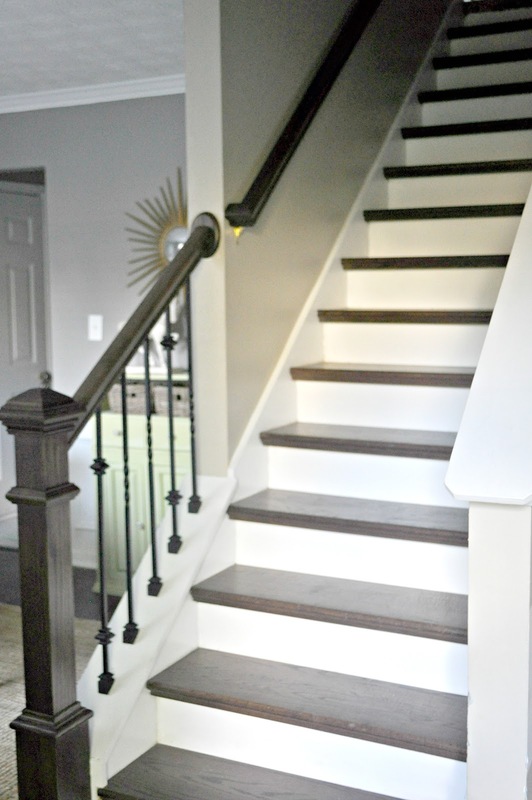 Your new stairs look so good, Erin! It's such a beautiful difference. We're planning to have ours done before Thanksgiving. Hopefully they will look just as nice! Thanks Brandi. I cant wait to see yours! Its definitely gonna change the entire look of your home. Cant wait to see.